Since our inception, Princeton Prosthodontics has provided New Jersey patients statewide dental and maxillofacial care at the highest standards. Dr. Michael R. Cortese and our friendly, skilled staff utilize the latest in computer imaging technology to plan your treatment and achieve the best results. Our experienced dentists and highly-qualified auxiliary personnel will ensure that all your concerns are met before and after surgery. At our Princeton, New Jersey oral and facial reconstruction practice, we are committed to providing the best possible care in a warm, relaxing setting. We know that the technology of oral and facial reconstruction is always evolving and we equip ourselves accordingly. 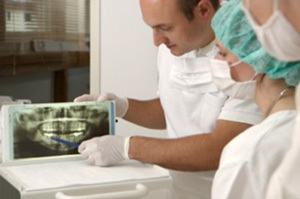 Contact our state-of-the-art Princeton office today to schedule a consultation. Whatever your need, the staff at Princeton Prosthodontics use the most up-to-date and clinically proven procedures to ensure your safety, minimize your discomfort, and achieve the best possible results. Benefiting from years of experience, our surgeons are well qualified to provide the exceptional treatment you seek. We hope you will stop by our Princeton, New Jersey office where we would be honored to provide you with care for years to come. Prosthodontists boast specialized training in restoring, replacing and shaping teeth, and literally bringing smiles to millions of patients worldwide. To receive certification from the ADA, prosthodontist candidates must complete four years of dental school, followed by an additional three years of training in a graduate education program of prosthodontics accredited by the ADA. A member of the prestigious American Academy of Maxillofacial Prosthetics, our Princeton, New Jersey cosmetic dentist is one of only 350 accredited Maxillofacial Prosthodontists worldwide. He is a member or associate member of the American College of Prosthodontics, the American Dental Association, the Society of Clinical Oncology, the New Jersey Dental Association, the Federation of Prosthodontic Organizations, the Osseointegration Society, and the Academy of Osseointegration. Princeton Prosthodontics provides New Jersey patients statewide with exemplary oral and facial reconstruction. You will experience the ultimate dental experience: complete relaxation, superb dental care and the most advanced treatments cosmetic dentistry has to offer. With an unparalleled standard of artistic skill and technical excellence, our doctors craft perfect smiles. Our Princeton, New Jersey cosmetic dentist serves patients in Mercer County, Somerset County, Bucks County, Pennsylvania and beyond. We invite you to schedule a free consultation today to being the process of restoring dental health and enhancing your smile’s beauty.